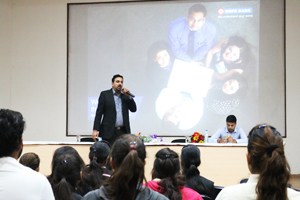 The HDFC Bank Recruitment Team conducted Campus Placement drive for students of MBA and PGDM. Incorporated in 1994, HDFC Bank is India’s largest private sector lender by assets, and is also the winner of “Bank of the Year 2017” award. HDFC Bank is an Elite Recruiter at IPER Campus. Best wishes to all the students !